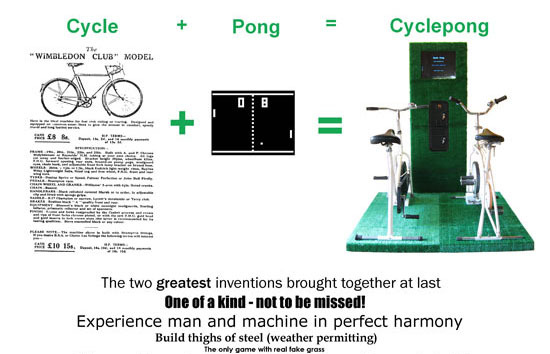 Cyclepong is currently in Tim Hunkin's new Novelty Automation arcade in Holborn, London. 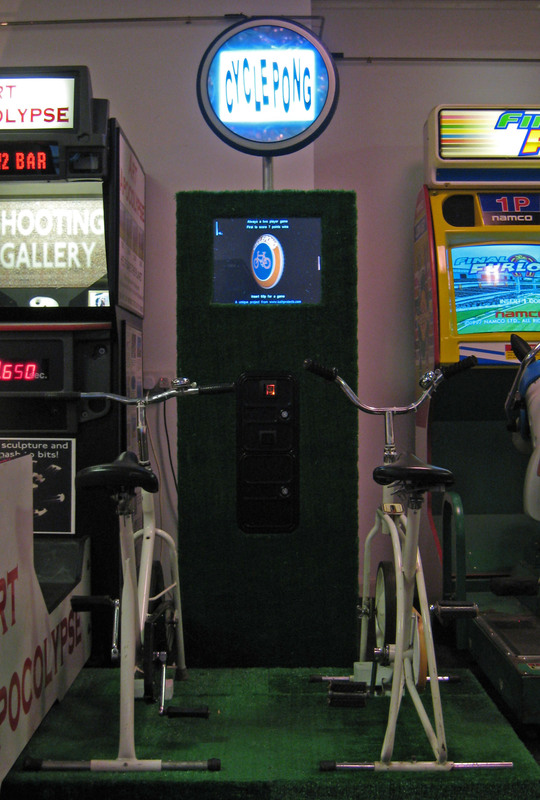 Cyclepong is an update of the classic arcade game Pong to use bikes as the controllers. 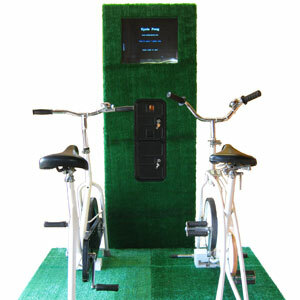 To read about the first version of Cyclepong go to the Cyclepong page. I always wanted Cyclepong to be something that lots of people would get to play with. My original idea was to take it to music festivals over the summer, but things took a bit of an unexpected turn after I took it to the Dorkbot London Christmas special. One of the people who played Cyclepong at Dorkbot was Tessa Hunkin who was there showing her lovely work on illuminated books. She suggested her brother Tim Hunkin might be interested as he runs an alternative amusement arcade on Southwold Pier. Through Tim we arranged to demonstrate Cyclepong to the pier's manager Stephen one winter afternoon. 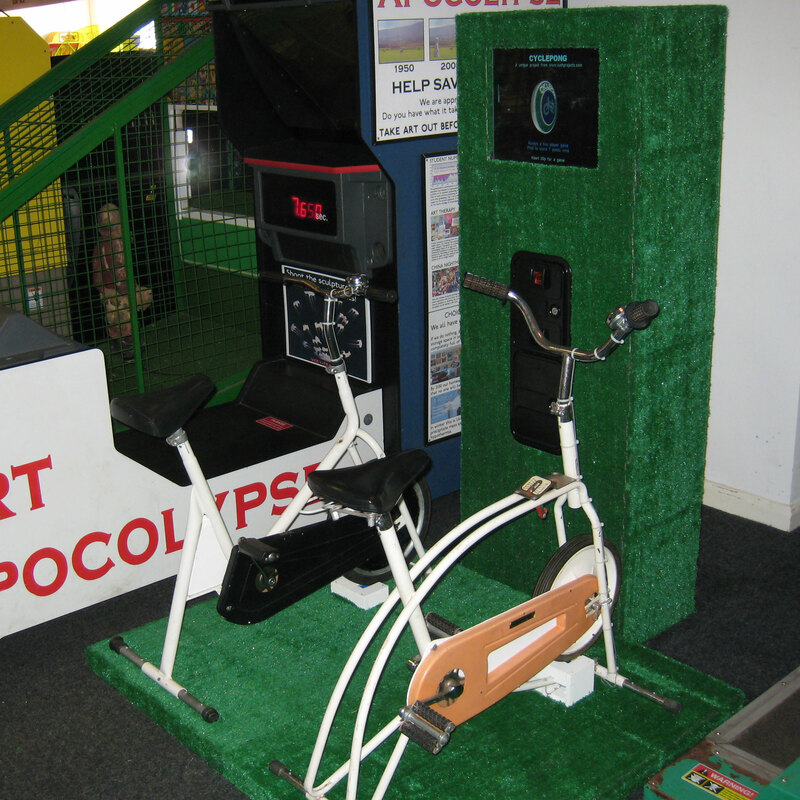 The demo took place in a corner of the arcade around a half-dismantled basketball machine. Demos are always nail-biting, but I wanted to show Cyclepong for real. Descriptions and video don't really do it justice. Fortunately things went well. Stephen liked the game enough to agree to find a home for an "arcadeised" version if I could produce one. 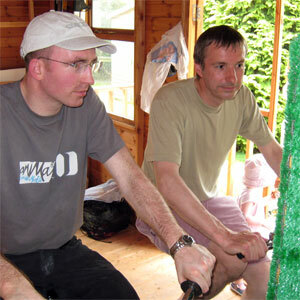 Both Tim and Stephen also came up with good ideas to enrich the playing experience. On my side I really liked the pier - while a lot of piers are in decline the guys on Southwold have done a great job doing something that is contemporary while still keeping the old fashioned charm. 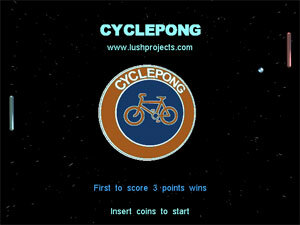 With a successful demo done I spent most of the winter working on the arcade version of Cyclepong. 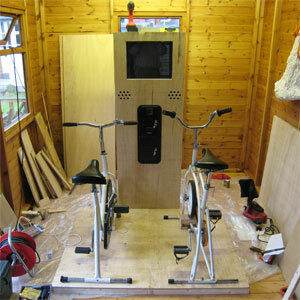 Work started with the cabinet and the base for the bikes. Two things dominated in my mind: it had to be really really simple and it had to fit in the back of my Mazda Bongo camper van. To meet these goals I decided to make the cabinet so it could be dismantled and transported as a flat-pack. Woodworking is not really my thing. I got the main panels cut to size by the retailer. This meant at least the main pieces were the right size and had true right angles. The rest of the cabinet work I did myself only using handheld tools. Despite my worst fears things worked out pretty well. The only thing that went badly wrong was an attempt to make a rather complicated bezel to fit round the screen. That part ended up abandoned. Other construction jobs included removing finger traps and covering exposed moving parts on the bikes. That was a tedious job, but necessary from the safety point of view. For the Cyclepong 2.0 I made various changes to the electronics and mechanics. The first change was to modify the way the position of the bikes is read. On the first version of the game I used a speedo cable to feed a hacked Microsoft mouse. For the arcade this looked too fragile to me so I moved the mouse on to the base board and used a pulley wheel to connect one axis of the mouse to the bike's wheel. This looked a lot more robust, but in fact this design proved to have one (almost fatal) flaw that I only discovered near the end of the project - more on that later. The next change was to introduce the coin system. I used an MEI Cashflow system from Brent Electronic. 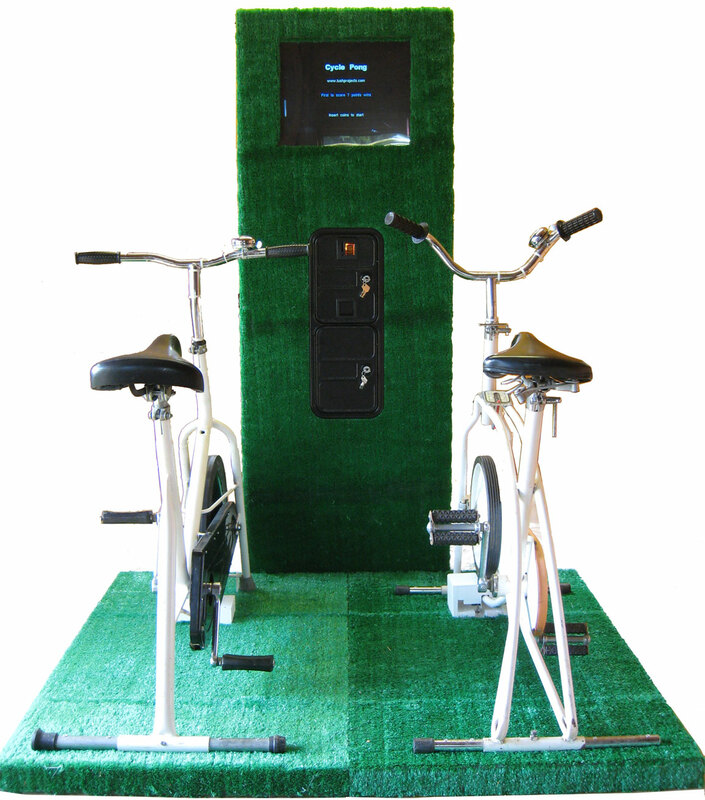 This is interfaced to the game using the AVR box that also reads the bikes positions. The AVR box actually keeps the master copy of the number of credits in play so even if the PC crashes people should still be able to recover their paid-for games. The coin systems are pretty neat pieces of kit by the way, but it's hard to understand the documentation for them unless you already know a bit about how they are supposed to work. The last change was to introduce a new display. 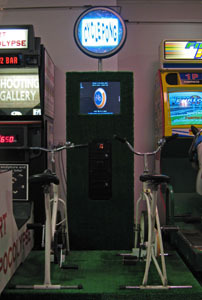 The original Cyclepong used a projector for the display. Clearly that wasn't going to work for an arcade machine that's switched on 8 hours a day. I took the need to find a monitor for Cyclepong 2.0 as a perfect excuse to upgrade my desktop monitor and speakers! The cabinet and base unit almost finished. Note the two boxes on the base containing the mice to read the bike positions. 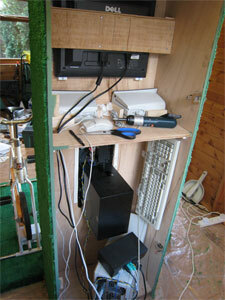 Having got the cabinet together I was able to do some serious testing in the new configuration. Initially the mechanical connection between the bikes and the mouse reading the position caused a few problems, but with a bit of redesign that started to work well. However having reliable mechanics revealed another much more serious problem. One disadvantage of the new layout is that the mice turn much more quickly than they did on the original. A bit of experimentation showed that on the left hand bike you could easily exceed the maximum speed the mouse was capable of reading accurately. Being a Microsoft product the mouse didn't handle this situation very well. Instead of setting the "overflow" bit in the reports back to the computer it just sent a string of random readings (including reports that it was moving in the opposite direction to the way it was actually rotating). This was really messing up the game play. At this point there were two mysteries. Why was only the left bike having problems, and how was I going to fix things? Closer examination showed that the bike that was working OK had a newer version of the Microsoft mouse with a different microcontroller inside than the one that wasn't working. Clearly somewhere in their production run Microsoft made a radical redesign of the mouse and the newer types cope with high speeds better than the old one. After a big search I managed to find one more mouse of the newer type and fitted it on the dodgy right-hand bike. Things now worked a lot better, but I was disappointed to find that at absolute top speed it was still possible to confuse the mouse and get bad readings. My first thought was to bluff this - I didn't think people would ride the bikes hard enough to expose the defect. I had to revise this opinion dramatically when I showed the almost finished version to my neighbour. He leapt on the bike and straight away managed to pedal hard enough to drive the mouse crazy. Finally I tried a hack which I thought was desperate, but in fact turned out to fix the problem once and for all (touch wood). I took the optical choppers out of the mice and cut off half the spines that trigger the IR detectors. I didn't think this would work because my previous experiments with the Microsoft mice had shown they were rather sensitive to the optical chopper being the right size. When I put things back together I was delighted to discover I now had two mice with half the resolution, but twice the maximum working speed of the originals! Problem solved, but things were pretty close to a major redesign. Modified optical chopper to fix the maximum speed problem. Stephen and Tim made some suggestions for improving the game-play on Cyclepong. Initially I was a little skeptical because I wanted to keep a strong flavour of the original Pong with it's basic graphics and simple sounds. Still the customer is king and for version 2 I added some new sound effects and also videos that play to celebrate winning and scoring particularly difficult points. Having done the work I have to say that the advice I got was good. These changes make the game much more interesting to play and generally more fun while still keeping the "Pongness" alive. As a final touch I added an intentionally naf animated Cyclepong logo inspired by the terrible CGIs used for TV sports coverage. Cyclepong screen shot - no longer quite the latest version, but pretty similar. Final pre-delivery testing took place at an afternoon garden party. All went well - no new bugs found and most importantly people enjoyed the game lots. The public testing did highlight a few things in the software that needed to be fixed to make the controls clearer. After missing the first few balls most people pick it up pretty quickly and find the game absorbing. The simplicity is one thing that people relate to. Delivery to Southwold Pier took place in May 2008. 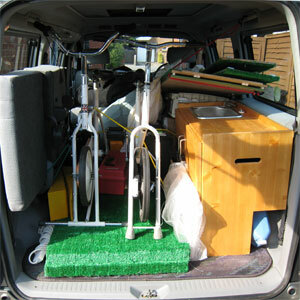 Cyclepong actually fitted in my van pretty easily - I could have made the case bigger perhaps. On the pier it was installed next to Tim's Art Apocalypse machine which is very appropriate. Deep breath, but it worked perfectly once assembled. Of course though Cyclepong looked huge in my workshop it looks rather puny at the arcade - partially because of the design need to fit in my van. The plan is to expand it a bit with some additional signage to make it more prominent - updates on that later. 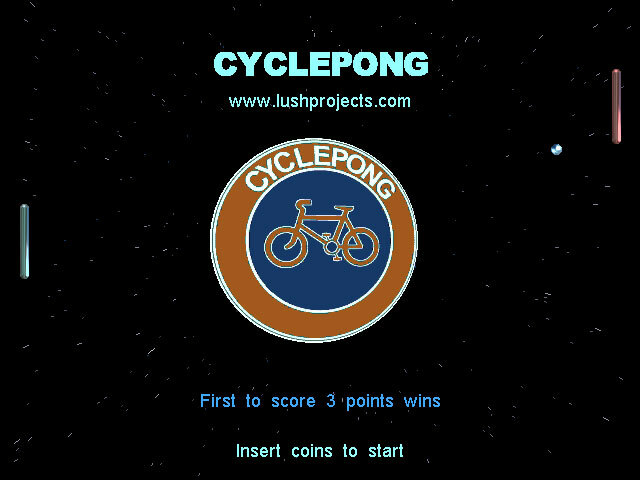 For me personally getting Cyclepong to the arcade was a triumph, but I now see it is just a first step in a process of debugging, publicising and maintaining the game. I still have a few things to do including a sign and also some publicity posters to put up around the pier. There might also be a few more tweaks to the software. It's still too early for me to tell who well it is going to work long-term. More updates will come throughout the summer. 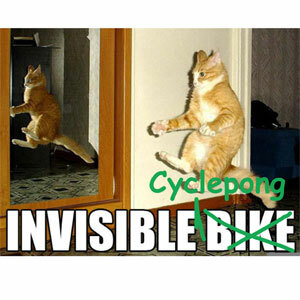 The overall difficulty of building something like Cyclepong is hard to calibrate. 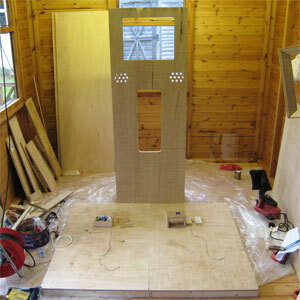 On the one hand it has a lot of different skills involved: hardware, software, design, graphics, carpentry. 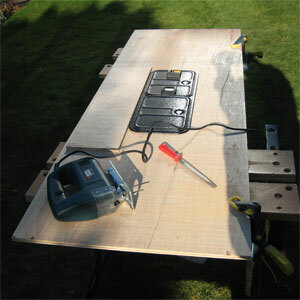 On the other hand it was built completely from common tools and without a big workshop. If you fancy making something similar yourself then I would say go for it. Cyclepong has been a big project for me and it's great to have got it this far, but I am still nervous about how it will survive in the rough and tumble of the arcade. Time will tell. It's been two months since Cyclepong arrived on Southwold Pier. The good news is that it still works and is doing steady business. With some help from Tim Hunkin we put up some posters to draw people to Cyclepong as it is a bit away from the other "eccentric" machines. I've also updated the teaser graphics a little bit. The finishing touch was to add a sign made from an old LCD backlight and a bicycle tyre. Next to the other machines in the arcade the plain grass looked a bit, well, boring. Possibly the sign is a bit too high above the machine. If I get motivated I'll go and shorten the pole it stands on. One pedal dropped off one of the bikes in the first month due to overuse. Hopefully we've tightened it up enough now that it will stay put. One of the bike bells has broken, but it doesn't really spoil the game play. Another minor thing to take care of if I get around to it! Well it had to happen eventually. Just a week after I wrote the last update I got a message that Cyclepong had broken. 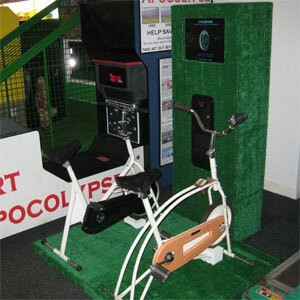 One of the bikes no longer moved the player properly. The good news is that the damage was due to over-use - so people must be having fun playing it. The bearings in the mouse used to track the bike had worn away which stopped it from working properly. 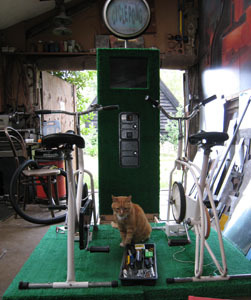 Tim Hunkin and I took Cyclepong over to Tim's workshop and with the help from random cats (possibly attracted by all the discussion of mice) designed and built a new sensor system for the bikes in a day. I also took the opportunity to replace the broken bell. The new bike sensors run off the speedo cable on each bike (just like the original Cyclepong design). In this version though we've taken the mouse mechanics out entirely. 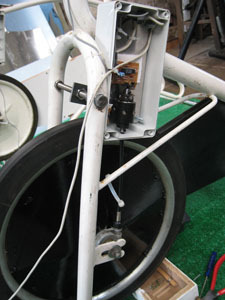 The chopper wheel from the mouse is connected directly to the speedo cable using a coupling based around two roller-blade bearings. 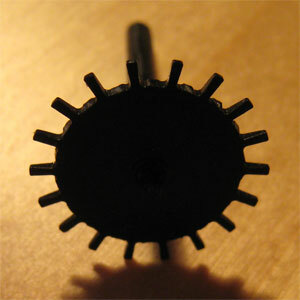 The original electronics from the mouse is then positioned in the right place to read the chopper wheel. Hopefully this version will be more reliable as we've removed the mechanical stress and plastic bearings of the original mice, and also the speedo cable rotates much more slowly than the mouse in the original position. Fingers crossed! Cyclepong is returned from Southwold Pier. It had a hard life there but a reasonably productive one. It never made loads of dosh, but it had a steady fan-club and made lots of people happy!